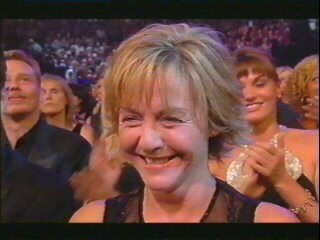 Amanda Burton and Sarah Parish were present at the 2003 National Television awards as they fought it out for the Best Actress prize. Unfortunately Amanda and Sarah were piped to the post by Eastenders' Jessie Wallace. However both ex PP actresses looked like they had a good night, and with more drama's to come from both Amanda and Sarah we bet there'll be back on the shortlist next year!! Check out our sneak pics and witness Amanda blowing a cheeky kiss to the viewers! !